Yesterday, I wrote about a step-by-step process on how one can start a business in India. 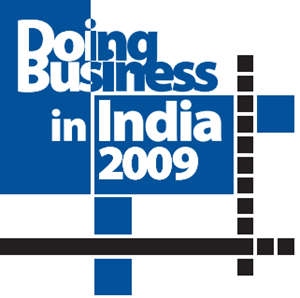 Today’s report – Doing Business in India 2009 – released by World Bank takes a more holistic view of it. Today’s report is a much comprehensive look at doing business in India and talks about business regulations and their enforcement across India. 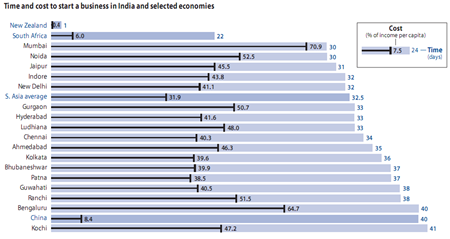 It also gives an overview of how India compares to other countries in “doing business” parameters. forms have worked, where, and why. 2 Where is it easiest to do Business in India? 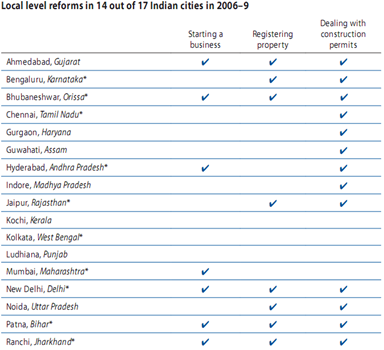 3 In which cities are the most reforms happening ? 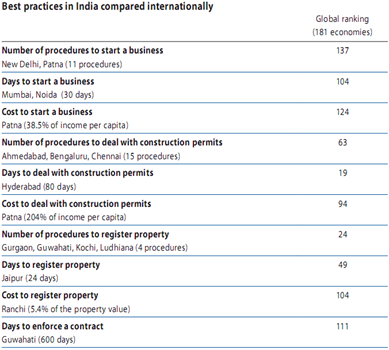 4 How does India Fare when compared to Best practices followed globally? 5 In which Indian city is it easiest and fastest to start a Business? Where is it easiest to do Business in India? Now, there is difference between “doing business” and “starting business”, where the latter is just a subset of the former. The above ranking includes all the factors from starting a company to probably closing it down. If you see the ranking, Ludhiana takes the cake when it comes to ease of doing business, followed by Hyderabad, Bhubaneswar, Gurgaon and Ahmedabad. One would imagine that places like Mumbai and Bangalore would rank highly here, but they are placed at lowly 10th and 13th respectively. 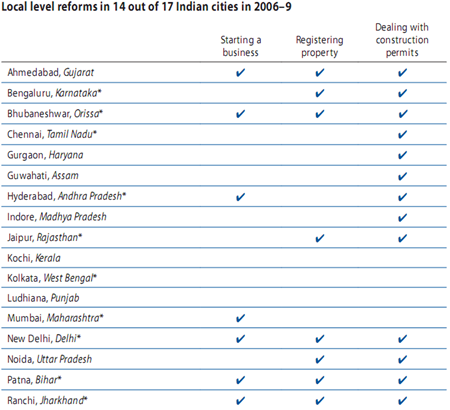 In which cities are the most reforms happening ? Although, India is ranked quite lowly compared to other countries, there are quite a few local level reforms happening to ensure that the process of doing business gets easier. Incidentally, Trade is the area where India has reformed the most. India was the top reformer on the trading across borders indicator in World Bank report Doing Business 2008 and continued reforming in Doing Business 2009. Gujarat (a.k.a – Narendra Modi) has come to limelight in last few years for making the state more business friendly and the chart above is the testament to that fact. Ahmedabad Ranked at the top with heavy reforms in all categories of starting a Business, registering a property and dealing with Construction permits. Bangalore, Bhubaneswar, Chennai & Gurgaon wrap up the top 5 spots. How does India Fare when compared to Best practices followed globally? 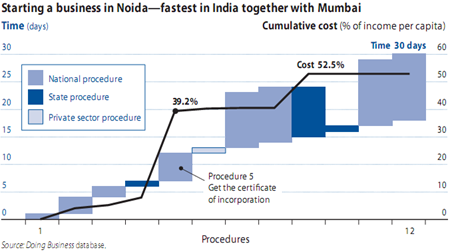 India is has roughly 11 procedures, with most states having 12-13 processes if you want to start a company in India. This puts India at a very poor 137 rank when compared to other countries. Some European countries have just a couple of process if they need to start a business. The area of “starting a business”seriously needs to see some reforms , if India has to promote Entrepreneurship and Innovation in India. Even when it comes to number of days required, India is ranked outside of top 100 countries – In India it takes more than a month if you want to start a business (that too if everything goes well, which is rarely the case). 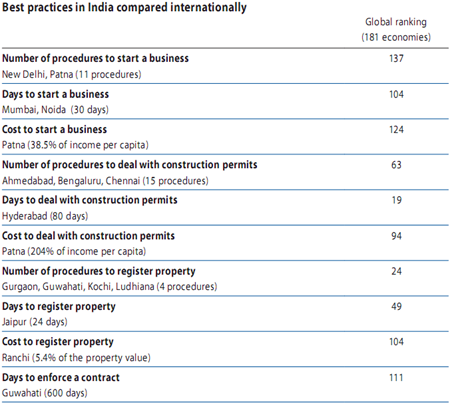 I think the only area in which India has able to create some reforms is the amount of time it requires to deal with construction permits where it has a ranking of 19. 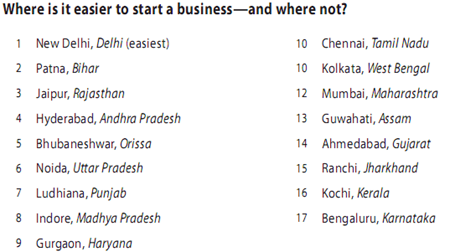 In which Indian city is it easiest and fastest to start a Business? The Indian capital – New Delhi – ranks the top where it is easiest to start your own business, where Bangalore fares the worst among the top cities in India. ..and when it comes to fastest in starting a Business it is the Financial capital of India, Mumbai along with another Industrial hub, Noida. Take that – In New Zealand it takes just a single day to start a Business and just 0.4% of per capita income compared to 30 days and whooping 70% of per capita Income ! What would you say to that – Luckily we take slightly lesser time to start a business as compared to South East region ! The Following report by World Bank talks in complete details on below given parameters of doing business in India. It will be super if you update this article to include the recent changes including GST, Govt. Programs like Make in India, Start Up India, etc. This is very informative and well researched article. Yours is an excellent aritcle. I have an article which I have published in a blog site. I would request you to read that and explore how you can help or contribute to explore the opportunities in education. I can send word document for you to read if you reply to my email id. However you can use the link as below. I am looking for educationists to explore education sector in India and Indian states. I do not have a proposal but I do have a scenario where a lot can be explored. Somehow the basis of this research is not very clear to me.. whats the methodology for such criteria & their development process? 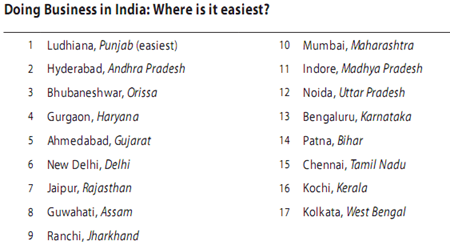 That great to see Delhi is the easiest to do business but Mumbai like more difficult. A very nicely written article. Well done. Good researched and very well written article.Keep it up. nice guide, but you just said which city is easy to start business, but the cities you said are the top cities and india and there are huge competition,, so it is difficult to survive in such big cities..
Great infos and certainly I am looking a way to do business in India and of course looking for a good business partner from India. Will explore the options and by the way this is definitely a great blog. We have to put things in perspective when talking about countries like India. Everything will look different if you know the right people in the right places. I think I can beat New Zealand in some states! Ethics I tell myself, ethics! how to start a power plant business in india? came here through the twitter handle, very nice informative blog! !